There are several options you have when it comes to managing your account. This help document will focus on some of the base functions such as viewing team assignments and managing your payments. 1. Start by going to ButlerFury,com and clicking on the button at the top Marked "Manage Account"
2. This will take you to the Stack Sports login page. Stack Sports is the company that runs the user account site. Login with the user account and password you used during registration. 3. Once you are logged in, you are in your 'Member Account' page. Down the left side of the page are the options. 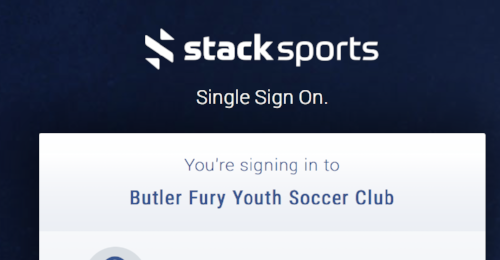 You can register for other events, view what teams your players are assigned to, look at what events you have registered for, change your password, or add a family member. On the right side are the family members you have added to the system. At the bottom are any notices and outstanding balances you have in your account. For example, if you have one child who has been accepted to a team, you should see a minimum of a $150 balance. If you are still uncertain if you have been assigned to a team, you can quickly and easily check by clicking on the 'View Team Assignments' button at the left. This will take you into the team assignment page where you can see if you have been assigned to a team. You can make payments in one of three ways, mail in a check, pay online with electronic check, or pay with a Debit/Credit Card. In the memo of the check, write your players name and the age group that player is playing at. If you wish to pay by Debit/Credit Card, or Electronic check online, follow these instructions. 1. From the main 'Member Home Account' page, click on the 'Pay Now' Button under account balances. 2. On the next page, it will show a summary of any fees you owe. After verifying, click the 'Next' button at the bottom. 3. The next page is the Payment page. Select what type of payment method you would like to use. Then verify your billing information, and fill in the information for your checking account or credit card. At the bottom, you will see the amount you want to pay. For the deposit to reserve a spot on the team, a minimum of $150 is due at time of acceptance. 4. After you have finished and it has taken your payment information, you should be presented with a receipt you can save for your records. At the main 'My Member Account Home' page, on the right you should see Member Profiles. If you have not uploaded a picture or your players birth certificate, you will see a blank spot next to their name. 2. If you have the ability, size the picture to 300 wide by 400 tall. This will make it much easier to crop once you upload it. 1. Click on the upward arrow next to the players name. 2. This will bring up the upload and edit window. Click on the menu icon that looks like a picture, select the picture, and it will upload. 3. You will need to crop the picture. Center the face to fill the frame as much as possible and click the crop button at the top. 4. When you are finished, make sure you click the save button. Then you can close this window. A clear picture of a birth certificate can be uploaded. A JPG picture is preferable, but a PDF scan will also work. 1. Click on the upload icon (upward arrow) next to the picture of the birth certificate. 2. A window will open to select the birth certificate. Find the birth certificate on your computer, select it, and upload the birth certificate.